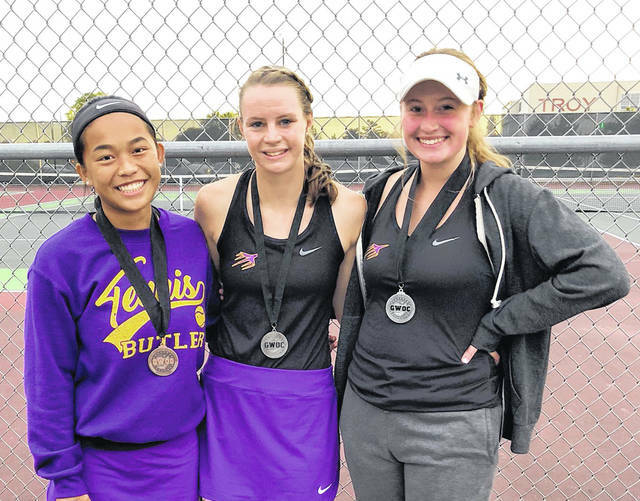 Butler’s Xia Lin (left) was fourth in the first singles bracket while Tori Studebaker and Rachel Burton were second in the second singles bracket at the GWOC Gold Flight Tournament on Thursday. TROY — The Butler girls tennis team placed sixth in the Greater Western Ohio Conference Gold Flight Tournament on Thursday at Troy High School. The top eight teams in the GWOC qualified for the Gold Flight bracket. These were Springboro, Centerville, Beavercreek, Tippecanoe, Miamisburg, Butler, Greenville, and Troy. Butler’s second doubles team of Tori Studebaker and Rachel Burton advanced to the finals with an 8-2 win over Greenville and a 9-7 victory over Tipp in the semifinals. The lost to Centerville 8-5 and settled for second place. Xia Lin defeated Abby Campbell in the first round of the first singles bracket 8-4. She then fell to eventual champion Springboro’s Katelyn Mazurek. In the third place match, she fell to Beavercreek’s Dhira Venkatramani 8-2 to place fourth. Erin Dean placed seventh at second singles as did Jo Velasco at third singles. Butler’s first doubles team of Ashley Hess and Savannah Scarpelli finished fifth. Next up for the Aviators is the OHSAA Sectional Tournament on Wednesday, October 3 at 8:45 a.m. at Troy High School.